Ho! Ho! Ho! 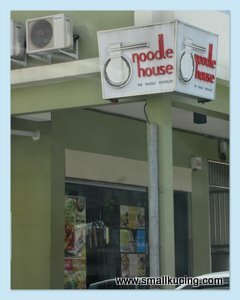 Uncle Arthur brought us to Noodle House. How he know I love noodles ah? Yummy yummy...wondering what is installed for me. 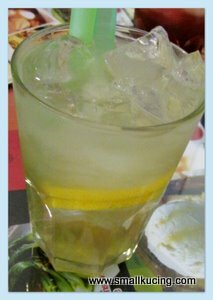 Mamarazzi ordered Honey Lemon with Aloe Vera (RM4.90). Refreshing though she couldn't taste the aloe vera. 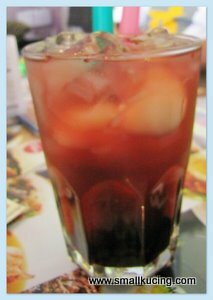 Supposed to be my glass of Mulberry with Aloe Vera (RM5.50) but somehow I preferred Mamarazzi's glass of Honey Lemon. Mamarazzi then had a taste. She didn't like it either coz for her it taste like drinking jam. Haiz...she really Auntie la. Not up todate one. The tall one is Horlick Gozilla and the short one is Horlick Dinosaur. Which one do you prefer? 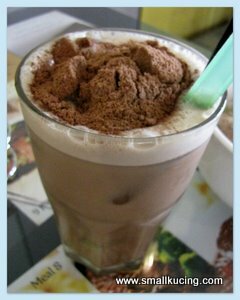 Mommy Ling had this very tempting Milo Dinosaur. 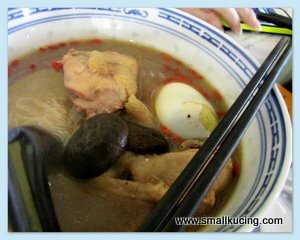 If I was not too busy having my noodles, I would have bodek-ed her for a try of this. Looks good. and the Double Chocolate Crepe, we finally get to have a taste of it. 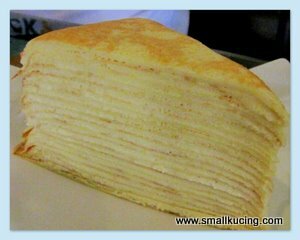 Surprisingly, Mamarazzi liked the Vanilla Mille Crepe better than the Double Chocolate Crepe. Next comes the Kompia stuffed with pork belly/three layer pork. Nice to eat while fresh and hot. Mamarazzi being 'kaypoh' (busybody), tried a spoon of the Mee Suah. She felt that although the taste of the herbs were there but not enough taste of alcohol. Uncle Arthur had the Beef Noodles but he "didn’t really like the beef noodles". Papa had the Kuey Chap Special. It was his first time having Kuey Chap hence he can't compare it with others. 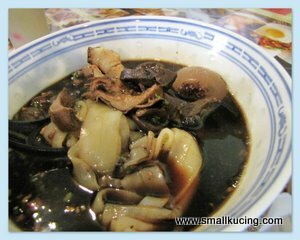 However, he did not like the Keuy Teow in the Kuey Chap. Papa ordered this Kampua Noodle for me. It comes with Lobak Soup. But I pretty much preferred Mamarazzi's Sizzling Beef Kampua. See! Doesn't this makes you drool? I was afraid Mamarazzi would eat all the noodle that I was not careful. Ter-touched the hot pan. OUCH!!! that's hot. Can continue enjoying the noodle. Mmmm...simply delicious though Mamarazzi said the meat was a bit tough. Ah...I don't care lah. I love noodles. Once again a big "THANK YOU" to Uncle Arthur. His hand very fast. Papa only managed to pull out one piece of red note pass to the Cashier when Uncle Arthur pulled out a "Golden Bull". Next time must act faster. Welcome. 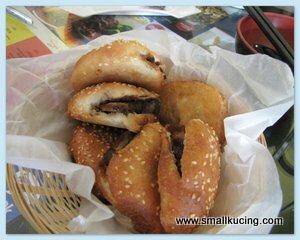 Small acfe, small treat...nothing much but your papakucing places the kompia there - the ones with pork belly as the NUMBER ONE food in Sibu! His favourite! Hi SK, I sure love those beef noodles. Looks really delicious! Looks delicious! What is horlick gozilla and dinosaur? I actually took quite a lot of breakfast just now. But now, still hungry when looking at your food. The drinks are so special. 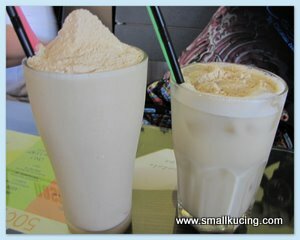 The milo and horlicks powder are still on top of the drinks. Wah, u're always eating & eating! Hahaha! Your son is enjoying a good life! Horlicks gozilla & dinosaur? I want, I want!! Is the horlick Godzilla sickening sweet with that hills of powder? Ur mamarazzi dun like jam drinks? tak apa... next time she dun like, u kasi auntie... auntie loves jam drinks... sampai ur mamarazzi kasi her orange marmalade oso she make it into drinks! ROFLOL! Ok....hopefully in April, I can go another round for the crepe! The Horlicks Gozilla sure attracted me. And of course, the mille crepe! I like the Kompia and your sizzling beef noodles, yummy! 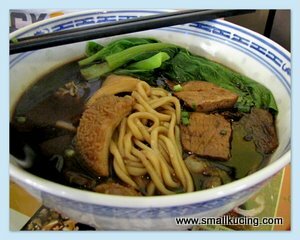 I would really really love to eat Kampua Noodle. 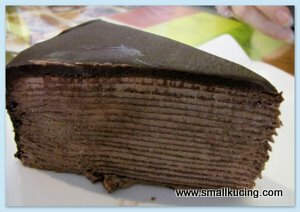 Oh my, what a huge spread of food and they do have that huge crepes in Sibu. Seems updated and latest too Sibu. Lovely food spread and am admiring some of it except the beef noodles. Good luck :) sucessful ka? Sibu is quite an advance city.